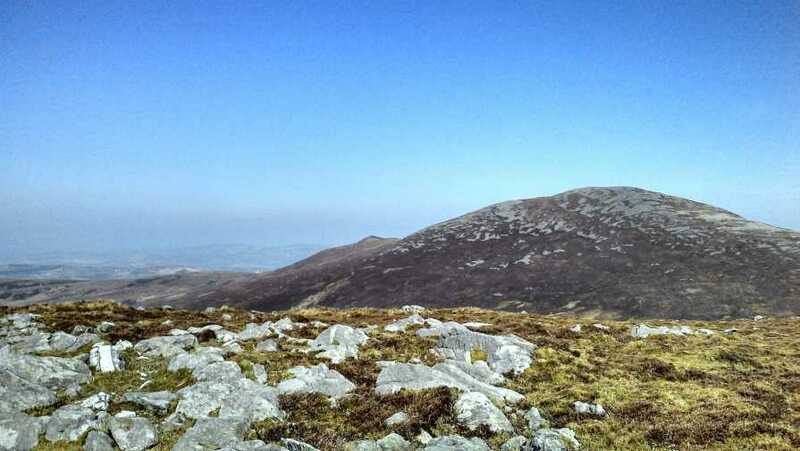 I roughly followed Simoburns track/2774 as a guide to the Damph, Slieve Main and Slieve Snaght loop. Simoburn must've had extra Weetabix that day as it took me an hour longer at 4 hours to complete. Parking at Point A, a lay-by with a line of sheep troughs, I walked ~100yards back towards Carndonagh direction before turning left up a short farmers track. After a very short time this petered out and I was left to make my own trail the rest of the trip. I made my way to a fence which runs across the valley between Damph and Slieve Main and headed for Damph. The ground to here was very deeply scarred bog, only 4 days of unseasonably warm and dry April weather dried this out enough to limit me to occasional bog hopping. From the West side of the fence I quickly rose to the top of a fairly featureless Damph although I did find a cluster of stones to be a perfect table and seat for lunch with a view across to the next 2 hills.